Today I am feeling really good. I've been spending the last few days prepping myself for the start of a new year. There are multiple transitions happening in my life right now - enough to potentially freak me out and send me to the psych ward - and while they are all good transitions, I felt I needed a moment to just be, think, and collect myself. The past few days were spent relaxing (an unbelievable amount), designing an ideal new routine (including blogging time, creative projects, and a workout schedule), and organizing my little apartment (well...half way anyway). After finishing school, starting a business, and finding new passions in 2011, I am launching myself into a new year full of completely new experiences. A new year full of an entirely new routine. In just a few short days I am starting a new job (so exciting!) and now that school is done I finally have time to spend on my business! It will truly be a new year for me and I can't wait to see what happens. So...I have been making lists (in the Bamboo Paper iPad app), using the fantastic and fun Unstuck app for assistance, taking stock of what really matters to me and what I would like to let go (on the chopping block...procrastination & clutter), all in the interest of devising a plan for success in 2012. 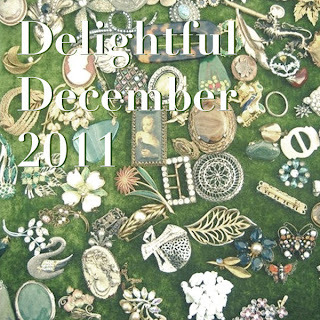 Last but not least, I have been working on my final playlist of the year...Delightful December 2011. Just some of the songs that have been playing along with me the past few days. The cover art with all of the lovely broaches is a print called All That Glitters by LolasRoom. (And it's on sale!) To all the music lovers, en-joy! Have a safe and Happy New Year and I will see you all in 2012. xoxo.